The cold winter months have arrived along with Garden Requisites’ new range of wirework fireguards. Inspired by the beautiful and practical designs from the past, two pared down designs are now produced to suit any style of open fireplace or woodburning stove. 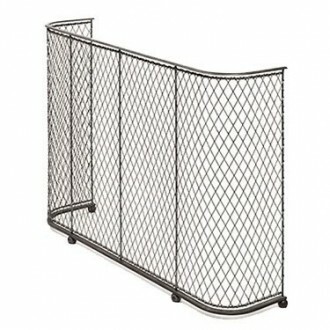 Unlike flimsy folding versions currently on the market, these solid steel wirework fireguards are designed to be robust and last a lifetime. The handwoven wirework diamond mesh is beautiful as a fire screen, and is subtle and understated enough not to detract from the fireplace. They can be left in place all year round, and as they’ve been hand made and hand finished, they have a wonderful tactile quality which makes them a joy to touch or move around. Optional spark liners and wall fixings are also available to provide additional safety solutions if required. Made to measure sizes can also be manufactured to suit your fireplace or stove, just get in touch with your requirements.